Strategic consultancy can be an intense occupation and, most days of the week, it’s not unlike the work involved in a university degree. This is precisely why we love what we do so much. We love the process of thinking, creating and strategising. We love helping our clients work through complex issues to come out the other side with a clear strategy and improved performance. But to remain fresh in the face of so much intense thinking, a few years ago we decided to recruit a new hire—of the four-legged variety! This new addition to our team would be in charge of play, fun and outdoor activities, giving us a much needed break from using our brains. Our first recruit to this role was Herbie, a Springer Spaniel and police dog in training. Arriving at just 6 weeks old, Herbie’s role was very much an apprenticeship scheme and he needed a lot of input and guidance. But, if a bundle of energy and fun was the aim of our hire, Herbie was certainly this—in spades! Mad as a box of frogs, he ensured we played…and walked…and played some more! And got rather grumpy if we tried to ignore him. Herbie’s apprenticeship with us lasted around 8 months until he moved on to his next stage of training with the police and we’re extremely proud of his accomplishments—last year, he was employed at the Olympics as a drugs detection dog. The day that Herbie left, we recruited another new hire—Jess, another police dog in training. She had been donated to the police at around 8 months of age, but after a short time with us, it quickly became clear that she wasn’t really cut out for police work—she was far too interested in cuddles and not really interested in a tennis ball! 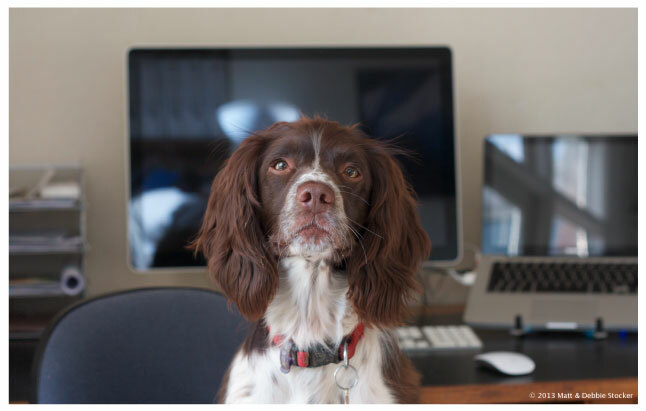 Sadly, she failed to make the grade as a sniffer dog but, as is so often the case, although she wasn’t quite suitable for that role, she was perfectly suited to the Office Dog position we had open. Today, Jess is a permanent member of our team. A passionate sprinter, bird, cat and squirrel enthusiast, and general loon, Jess makes sure that Debbie and I focus on the important things in life—like playing ‘find it’ and ‘tug’. She’s also in charge of break times and walks, whatever the weather! Jess has been a great hire and has achieved everything we hoped for in her role. It’s likely that she’ll feature in a few more articles too, but for now, if you’ll excuse me, apparently it’s walk time! Love this article. I imagine Jess maximises your intellectual and commercial effectiveness also! She is also fond of reindeer skin.